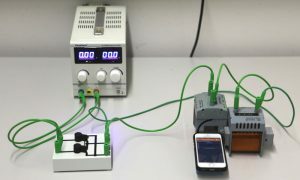 We have just published an article in the German journal “Physik in unserer Zeit”, presenting phyphox and discussing its abilities to create customized experiments and remote control. We demonstrate this using a wheel rolling down a hill with the smartphone placed in its rim. 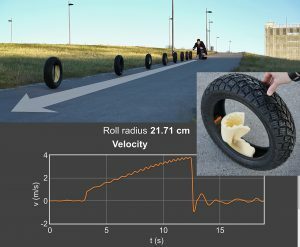 In this experiment, phyphox autonomously determines the radius of the wheel and its velocity (similar to the roll experiment shipped with phyphox). If you want to try the experiment described in the article, you can open it directly in phyphox or download it. The experiment expects the phone to be as close to the outer radius of the wheel as possible and rotate about the x axis.